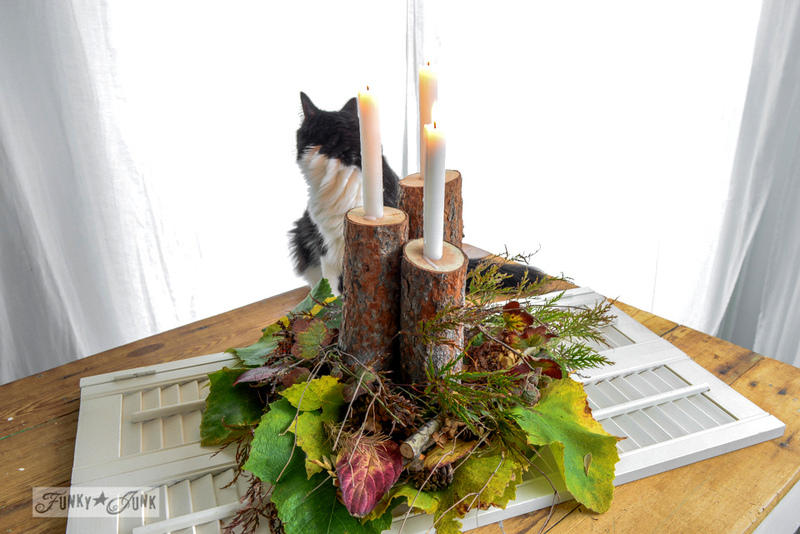 Rustic log candle fall centrepiece … and a cat. Today’s post is brought to you by Thanksgiving in Canada, and a cat photo bomber. My son wanted a nice dinner for our Thankgiving, so I got all fancy like, and picked up a ham, whipped up some homemade scalloped potatoes , applesauce, ambrosia, and a few other fun things. 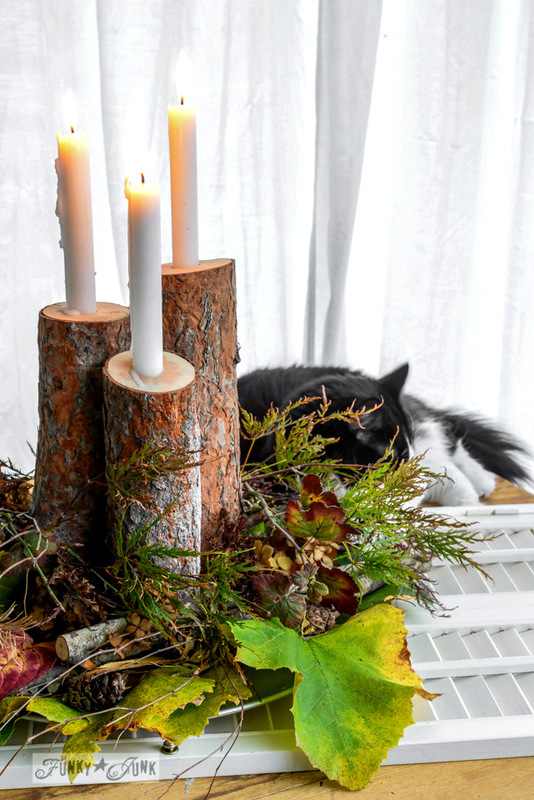 But no Thanksgiving table is complete without a fall centrepiece of some sort! You may recognize the log candle base. This started off as a Christmas log centrepiece. (click for tutorial here) I attached some cut down firewood to the base of a pizza pan, threw on a rusty old plant stand and added the fresh greens. The addition of the cat was a nice perk of course! Skye loves to spec out whatever I make. All I did differently was go shopping to the outdoor mall right in my backyard. 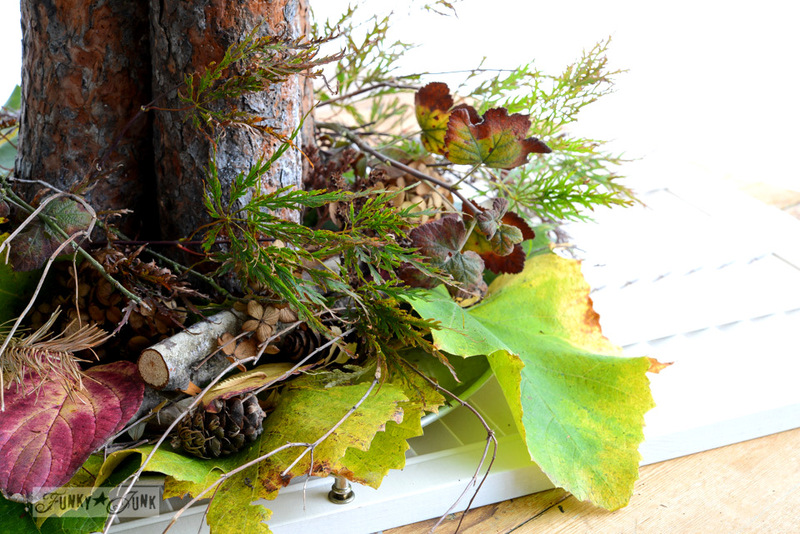 We have grapevine leaves, pinecones, dead Christmas tree bits, branches, dried hydrangeas and pieces of tree branches. Just whatever was available. Everything was piled up until I achieved the layers and height that was pleasing to the eye. On top of one of the shutters I got from my neighbour! Pssst…. Skye, if you’re going to be in the picture, turn this way? No? Well, then you’ll need to move. But only for a moment, I promise. I must say, dinner was awesome! It’s been awhile since I cooked enough for an army of teen boys! Much to my son’s delight, he claims his 3rd helping (which he couldn’t polish off) will be his breakfast tomorrow. And the centrepiece was perfect. One day I’ll pick up some photography lighting so I can shoot in my kitchen. It’s a cave this time of year, and with the black metal topper, it’s a tough capture. Thank goodness for my photo studio! 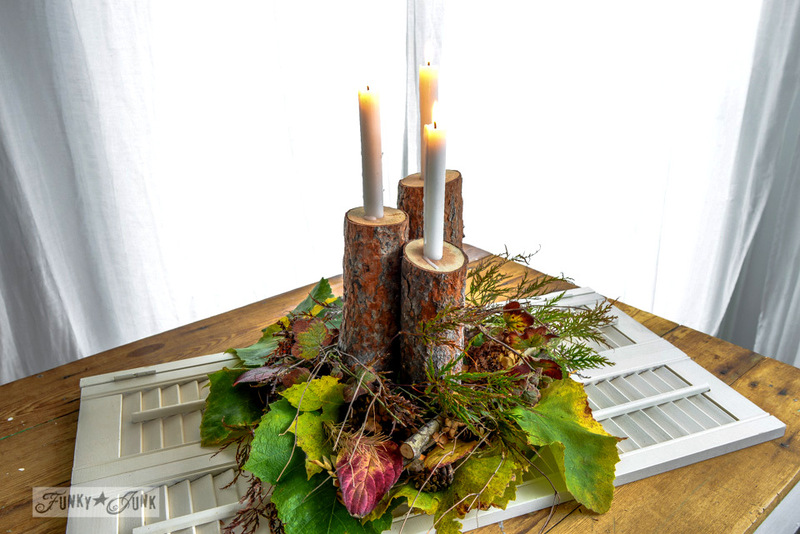 Perfectly rustic, easy, pretty, natural, and free of course! When Cats Photobomb – with a little slide show! See Skye helping me package something up – VERY cute! #14 – You can make do with what you have. Because we have FAR more than we even realize. We just have to open our eyes to it. Brilliant! I must try that! Thanks, Donna, for the idea and inspiration! 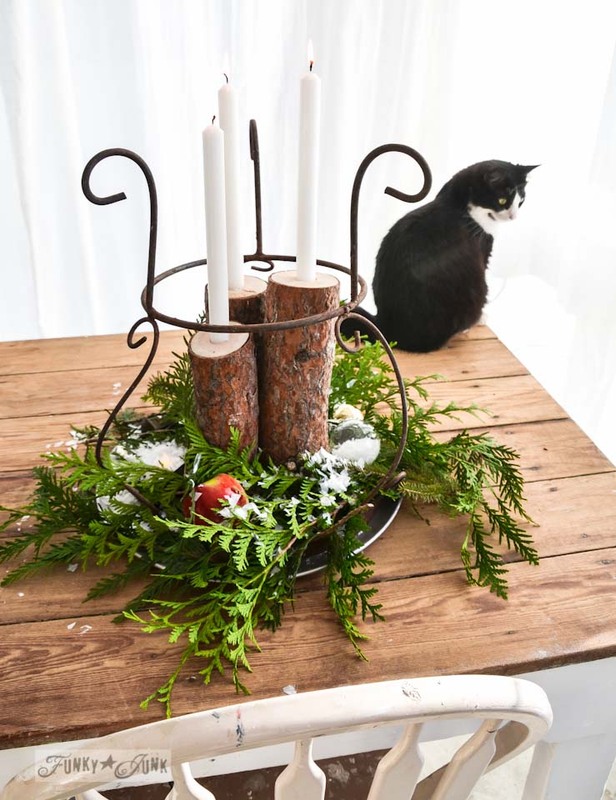 I love the centerpiece with the gorgeous candlesticks…and must say that “girls just wanna have fun”….love your photo bomber!!! This is the Best Fall Centerpiece I Have seen Yet. Super lovely, I love the rustic look. 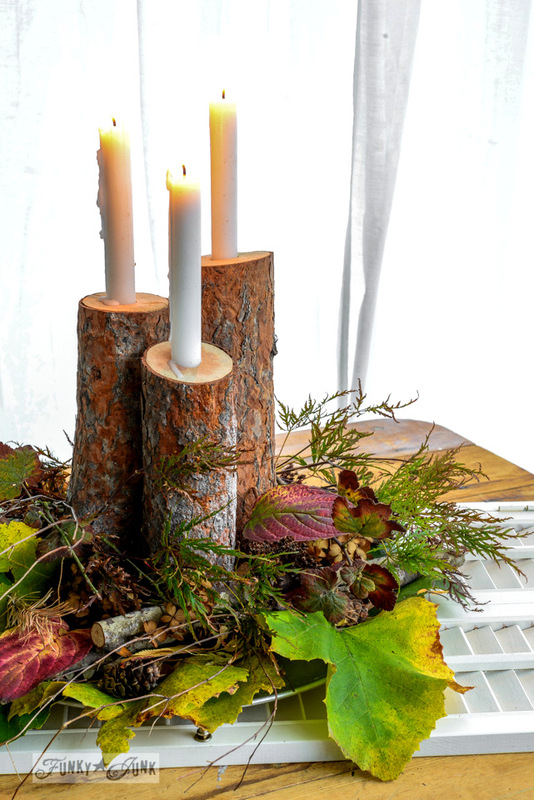 A friend made log candlesticks for her daughter’s wedding reception and after the wedding they were being thrown so I took several. Use them at Christmas, but never thought about using them for Fall. Love, love, love what you’ve shown me I can do! Lovely, Donna! What did you use to cut the logs and attach to the pan? I used a miter saw to cut the firewood and screwed the wood from underneath through a pizza pan. LOL I had a link to the tutorial in the blog post but I’ll go back in and make it more obvious right now! I just love this! Can’t wait to make it! We just cut some limbs off our trees. I know I can find one that will work! I love that it can be used for fall and winter. Thanks for the inspiration! The center piece is beautiful, perfect for this time of year. I love your kitty’s, I love the way they think they are supposed to be in the photo’s, my cat thought if it was special enough to take a picture then he should be in it. I love this time of year I always feel like cooking big meals and it is always rewarding when you have a good eater, and not a lot of leftovers. I love your kitties. Skye reminds me of our Franklynn, right down to the black furry chin. Franklynn is a bulky boy and rides low to the ground. He loves to “chase the kitties” (aka terrorize our 3 girl kitties). Love the rustic nature centerpiece. Of course, I love cats, yours is so sweet. Happy Fall. Thank you Donna, I appreciate the picture of Skye. Some day I will send you pictures of our Gertie and Lucy (Lucifer because she is a DEVIL). Love the table and centerpiece too! Hey Donna…love the pics with the fur babies included. They make the post warm and fuzzy! I reread the post with all the photobomb pictures, what a delight they are.My chichi girl is 20 years old, lame and very untidy anymore, every day I wonder…how much longer.Vet says she is using the box and not hiding under the bed, nor yelling in pain.She is ok until she is not. I wonder if I can live without a cat, but we are moving once hubs retires soon and not too sure of where or what. So we will have to see. Love your sweet kitties. Keep posting them! Awww, 20 years for a cat is amazing! So glad she ended up in such a loving home! One day at a time… that’s all I could manage too. Thanks for including Skye (and Lake too!). I love following your blog and on pinterest. We (hubby and I) have done this project before and love the results! 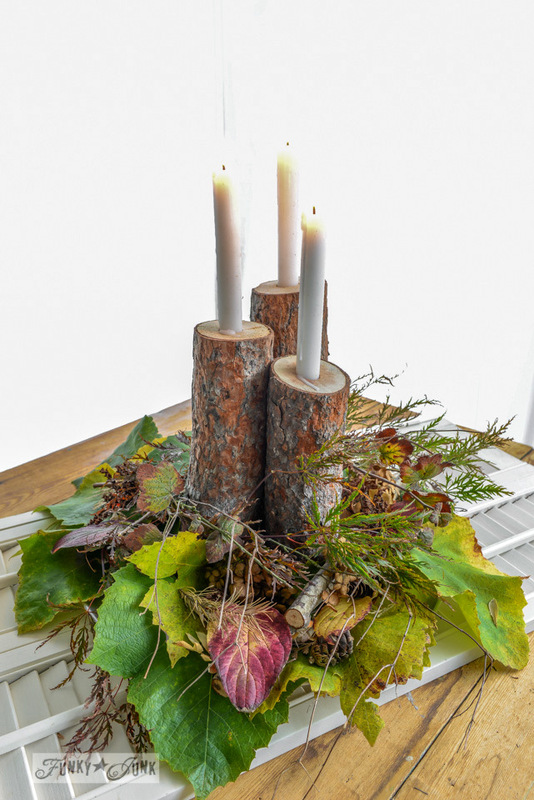 These center pieces look great and go from Fall to Winter easily. We used tea lights and set them even with the top of the logs. Cool burning candles work best. Keep creating! it is wonderful! Both centerpieces are lovely. Love them. I love nature. Now, THAT I would call absolute perfection…not to be improved upon!